A complete rig you can carry to a gig in a backpack and it could also take care of your recording needs. Axellent! Solid build. Good price. Loads of sounds. Fractal's Axe-Fx II amp and effects modelling processor is an object of desire for many guitarists, but it's not cheap, especially when it's paired with the MFC-101 foot controller to give it practical flexibility for gigging. However, there is now a more affordable way to get some of that Fractal amp modelling experience: while the company has previously put out the FX8 floor processor to provide Fractal effects for conventional amp users, it has now introduced the AX8, which offers amp sims and effects in a similar chassis for anyone who wants to connect straight to a PA and/or FRFR (Full Range Flat Response) cabinet. 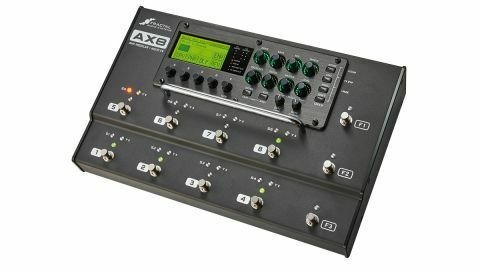 The AX8 features the same core modelling engine as the Axe-Fx II for identical sound quality, but has different CPU power and offers just one rather than two amp blocks in its signal chain. "A more affordable way to get that Fractal experience." It's still pretty potent, though, with 512 onboard presets that are built from a series of blocks. You get amp and cabinet blocks plus blocks for the most commonly used effects, and a looper. There are 222 amp models, over 130 Factory cabs, plus 512 User Cab memory slots and loads of effects. Everything has a massive amount of editable parameters to get the sound just right, either accessed from the AX8's physical controls or via the free editing software if you connect it to a computer. With rock-solid construction, the AX8 lays out its 11 footswitches in an easily accessible manner. All of them can be assigned to a host of tasks, all aimed at making your onstage experience go as smoothly as possible. Three function switches in a vertical array set things up, while the switches numbered one to eight can either select the preset in a bank, switch individual effects in a preset, or call up the eight scenes which every preset can have. These scenes are like mini presets themselves, and can take care of such things as turning several effects on with a single footswitch. In addition, each block has an X and Y setting - which can be a choice of drive pedals, delay feedback, and so on - and you can switch between these in the blocks assigned to footswitches by a press and hold. Overall, the operation is very easy to get your head around and further flexibility for live work is provided by four rear-panel sockets for expression pedals or extra footswitches. Sound-wise, Fractal's realistic amp tones, carefully tailored cabinet models and crystal-clear effects give you tones that can stand up next to any conventional amp and effects rig. If you like the idea of an Axe-Fx II but aren't keen on the rackmount format or thought it out of your price range, the AX8 may be right up your street. Okay, you can't run dual amp signal chains and there isn't the same complement of effects, but you get the same quality of sound and a great range of tonal options in a very practical form factor.